Vertex College of Science & Technology Islamabad Admission 2013 Vertex College of Science & Technology Islamabad Admission 2013 for Master of Science & Master of Public Health (MS-MPH), M.Sc. Community Health and Nutrition, M.Sc. Food & Nutrition & B.Sc. In Medical Technology. 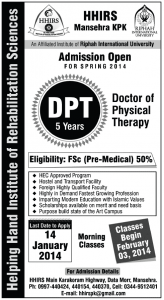 Pakistan Institute of Rehabilitation Sciences Islamabad Admission 2013 Pakistan Institute of Rehabilitation Sciences Islamabad Admission Notice 2013 Pakistan Institute of Rehabilitation Sciences Islamabad Admission Notice 2013 for BS Vision Sciences , BS Audiology (Hearing Sciences) , BS Orthotics & Prosthetics (Orthopedics Technology) , Orthotics & Prosthetics Technician Training Course.